A bizarre creature terrorized a town in West Virginia in 1966 and 1967, leering at locals with glowing red eyes, flying over their cars and causing radiation burns and even the collapse of a major bridge over the Ohio River. Half man, half moth? Ultradimensional being? Alien from another planet? What was Mothman? What began as a series of sightings of an unknown creature grew more complex and mysterious with each retelling. By the time the Mothman story made its way to a major Hollywood film, The Mothman Prophecies, Mothman was some sort of extradimensional harbinger of tragedy, an alien intelligence so bizarre we couldn't even begin to fathom its motives or methods. The movie weaves layers of creepiness and dread with personal grief and looming disaster, all as a backdrop for a positively Lovecraftian cosmic horror that drives men mad . . . and it is, of course, a work of fiction. But how did the Mothman legend get from "something weird some West Virginians saw late one night," to "entity from beyond time and space"? The story begins simply enough: a pair of young couples were driving around on November 15, 1966 near Point Pleasant, West Virginia. Their cruising spot of choice was a former TNT factory, vacant since World War II (and now known as the McClintic State Wildlife Management Area). The area is dotted with huge concrete "igloos" that once housed TNT stockpiles, and not much else. By '66 it was heavily overgrown and mostly deserted, and no doubt pretty spooky at night. There they saw the figure of a large winged man with glowing red eyes. Fleeing in fear, the couples reported that the being took flight and shadowed their route home. They reported the sighting to police, and news spread. Over the next few weeks, Mothman Mania took over Point Pleasant. Armed search parties scoured the TNT facility while numerous sightings poured in to police operators and newspapers, each one generally describing a creature that was roughly humanoid in shape, but grey or brown, with huge glowing red eyes and massive wings that unfurled from his back. There's been plenty of conjecture about what was seen on November 15. Skeptic Joe Nickell convincingly argued that they saw a barred owl (Strix varia). It's native to West Virginia, has an unusual shape with large legs, is nocturnal and thus not commonly seen, has large eyes that can reflect light with a distinct red glow due to blood-rich vascular tissues within the eye, and has startlingly large wings. A lot of the witness drawings of Mothman (there are no photos) do bear a remarkable resemblance to what a large barn owl might look like at night to observers who are already freaked out by being in a creepy abandoned TNT factory. What followed that initial sighting was practically a textbook case of mass hysteria. A rash of sightings, only about a half dozen of which were well-documented in local newspapers, swept nearby towns. 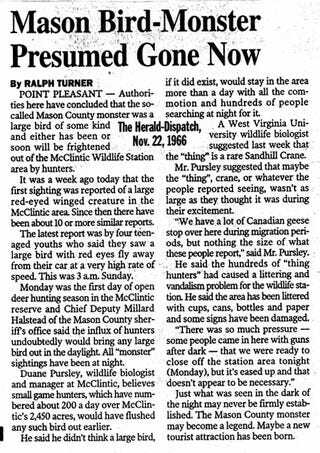 Many of the sightings bear little resemblance to the original Mothman description, involving men in black, strange lights and even poltergeists. Incidents ranged 50 or more miles from Point Pleasant. It was only a major national tragedy that caused the Mothman flap to die down; ironically, the same incident is often used as the climax or even the central point of the entire Mothman affair by Mothman believers. I'm speaking of the collapse of the Silver Bridge. The Silver Bridge crossed the Ohio River, connecting Point Pleasant, West Virginia to Kanauga, Ohio. It was built in 1928 using a steel eye-bar design, innovative at the time. On the evening of December 15, 1967, one of the eye-bar connections failed due to a minute manufacturing defect exacerbated by stress and corrosion. The resulting bridge collapse killed 46 people. Suddenly, the people of Point Pleasant had far more grave and serious matters to deal with than Mothman sightings. Interest in the otherworldly visitor vanished almost instantly. The mania had passed. It was only several years later that UFOlogists and paranormal experts started drawing connections between Mothman and the bridge collapse. Suddenly, there were reports of Mothman flitting about the bridge days or even moments before the collapse (I also find hilarious the reports of Mothman sightings before the I-35W bridge collapse in 2007 – I guess Mothman is a frustrated civil engineer?). Stranger still were stories of Mothman trying to communicate with people, and unearthly encounters with a man calling himself Indrid Cold who looked odd and spoke as if unfamiliar with basic human concepts. How did a simple story of a red-eyed flying beast get so elaborate? That is the stuff legends are made of – in this case, quite literally. The elaboration and popularization of the Mothman story is primarily the responsibility of two men: John Keel and Gray Barker. Most people know about Mothman from Keel's 1975 book, The Mothman Prophecies, upon which the 2002 film is based. In that volume, Keel outlined his own investigations around the Point Pleasant area, blended with accounts from various witnesses of Mothman related phenomena. Keel managed to graft himself into the Mothman story, describing weird phone calls and mysterious visits while he was performing his investigations. He crafted a far-flung, imaginative tale of government conspiracy, beings from other dimensions, creepy men in black trying to suppress Mothman witnesses, with Mothman flying above it all as an avatar of disaster and tragedy. The Mothman Prophecies was not the first book to inflate the Mothman legend, however. Gray Barker, perhaps most famous for popularizing the Men in Black with They Knew Too Much About Flying Saucers, wrote The Silver Bridge in 1970. 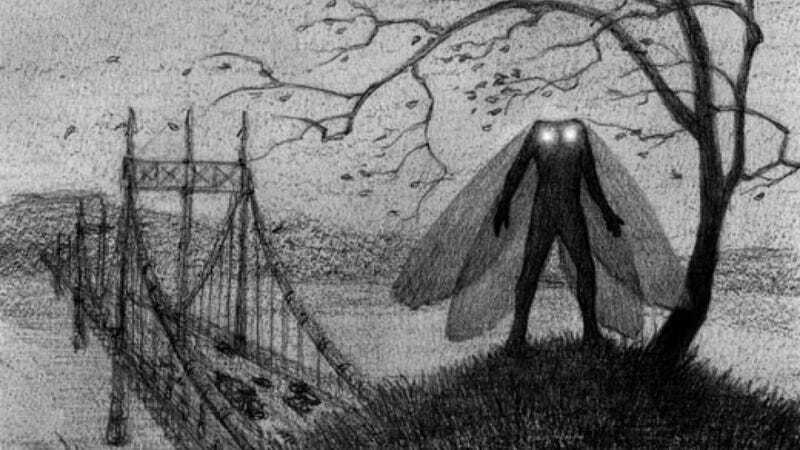 The Silver Bridge was the book that first connected Mothman to the bridge collapse and first wove an aura of tertiary paranormal phenomena around the Mothman story. Gray's book had a short publishing run and was not widely known at the time. Through letters published in 2002, it became apparent that Keel and Barker were well aware of each other in the 60s and 70s. At first they talked of collaborating, but there seemed to be some disagreement and the relationship devolved to antipathy. The whole incident was quite bizarre, involving the two authors accusing each other of being androids in league with the MiBs. Seriously, that actually happened. But the most telling part is that The Mothman Prophecies was not the first time Keel had written about Mothman. In 1970, right around the same time that Barker's The Silver Bridge was released, Keel published Strange Creatures from Time and Space (you might find a reprinted version today under the title The Complete Guide to Mysterious Beings). This wide-ranging work mentioned the Mothman story, but stuck to the basic facts of the few recorded encounters. Indeed, he seemed to be refuting Barker's claims (and directly contradicting the theory Keel would himself publish five years later), saying: "It is completely erroneous to blame the collapse of the rickety old Silver Bridge on flying saucers or 'Men In Black.'" Somehow, in five years, Keel went from a plain denial of any Mothman-Silver Bridge connection to one of the most elaborate and bizarre cryptid tales ever told, with himself as a central character. The clues to what sparked the change come, again, from the published letters of Keel and Barker. To put it bluntly, in much of their paranormal and UFO writing they were "taking the piss." As Barker put it in a 1970 letter, "the kookie books are about all that I can sell these days. I lost the 'sensible' subscribers…long ago, so I get a kick out of letting it reflect the utter mental illness of the field." Lurid tales sold a hell of a lot better than dry investigations that didn't find much of anything, and there was always some portion of the public gullible enough to swallow any story whole. So that was how they made their living. In an obituary for John Keel, skeptic and author Robert Scheaffer talked about meeting Keel, describing him as a "trickster." Scheaffer added, "He did not seem to be taking his own writings very seriously, which suggests that they were entertaining stories that paid the bills." If Keel's manner doesn't offer solid evidence of his fictionalizing, maybe the outlandishness of his tales does better. He once claimed, with no witnesses or evidence, that Mothman had attempted to carry off a Red Cross Bloodmobile. As Mothmen do. That leaves us with the smattering of Mothman sightings that have continued over the years – some even connected to Chernobyl! Legends take on lives of their own. The story lives on, conflated with local folklore (the Curse of Chief Cornstalk), ancient religious figures (guardian spirits known as garuda), and other cryptids (pterodactyls and the Jersey Devil). Some people love a good story and want to play along. Some people want to sell books and Mothman festivals. And there will always be some people who see something they can't explain and make it into a Mothman. Barker, Gray. The Silver Bridge. Saucerian Books, 1970. Keel, John.Strange Creatures from Time & Space. Spearman, 1970. Keel, John. The Mothman Prophecies. Panther Books, 1975. LeRose, Chris. "The Collapse of the Silver Bridge." West Virginia Historical Society Quarterly, Oct. 2001. Nickell, Joe. "'Mothman' Solved!" Skeptical Inquirer, March/April 2002. Nickell, Joe and Randi, James. The Mystery Chronicles: More Real-Life X-Files. The University Press of Kentucky, 2004. Scheaffer, Robert. "John A. Keel, Mothman Writer, Paranormalist Trickster (1930-2009)." Skeptical Inquirer, November/December 2002. Sherwood, John G. "Gray Barker's Book of Bunk: Mothman, Saucers, and MIB." Skeptical Inquirer, May/June 2002.